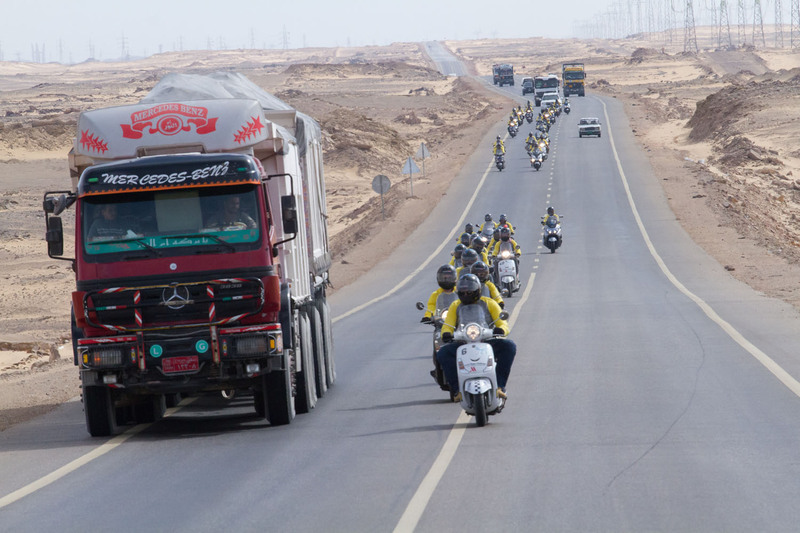 The following is my recap of the 2014 Cross Egypt Challenge – a 2950km journey across Egypt. Registration for this year’s event has closed, but if you’re looking for the ride of a lifetime, now is your chance to start planning for 2017. 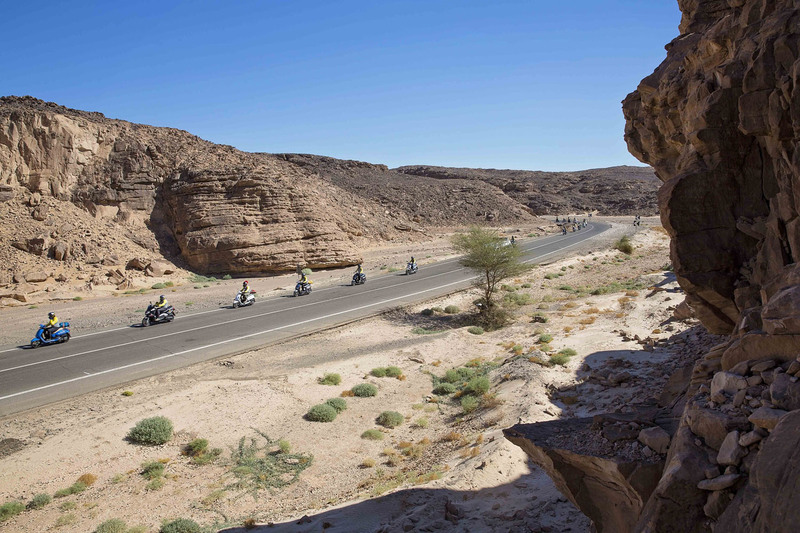 Each season of the Challenge introduces a new route throughout the most famous spots of Egypt, a track that nobody ever thought would be done on motorcycles or scooters. The series started in 2011 and this first season was a 9 days rally from the shores of the Mediterranean Sea in the North of Egypt to the temple of Abu Simbel, on the southern borders of Egypt with a total distance of over 1,700 km. 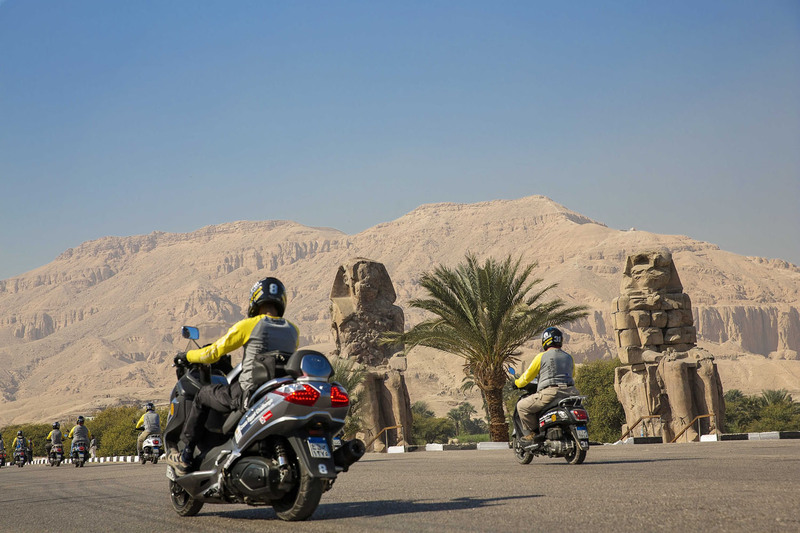 The 2012 season included a 2,400 km route starting from Egypt’s famous capital and passed through the most exotic oasis of the Egyptian Western Desert before ending the season in the world’s largest open air museum, the city of Luxor. 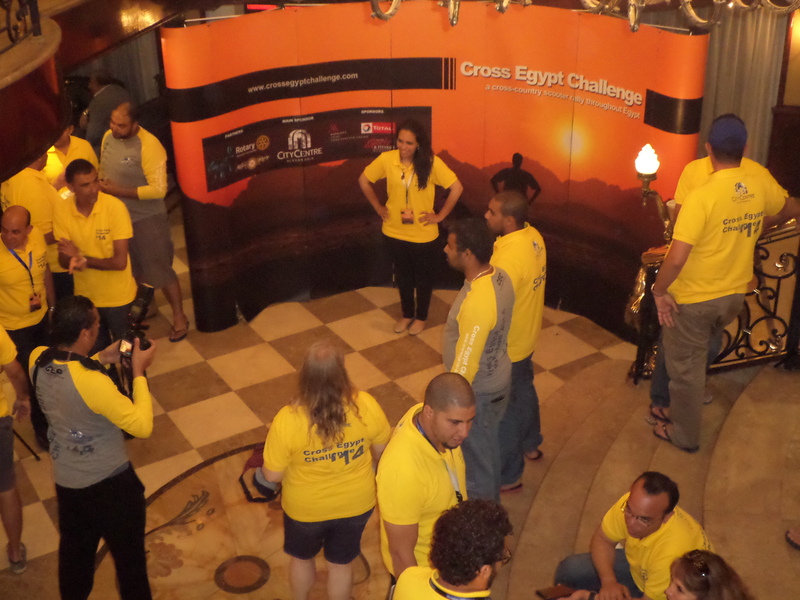 The 2013 season of Cross Egypt Challenge also witnessed a 2,400 km route starting from Egypt’s famous coastal city Alexandria and passing through the Egyptian Eastern and Western deserts before ending under the Great Sphinx in Giza. 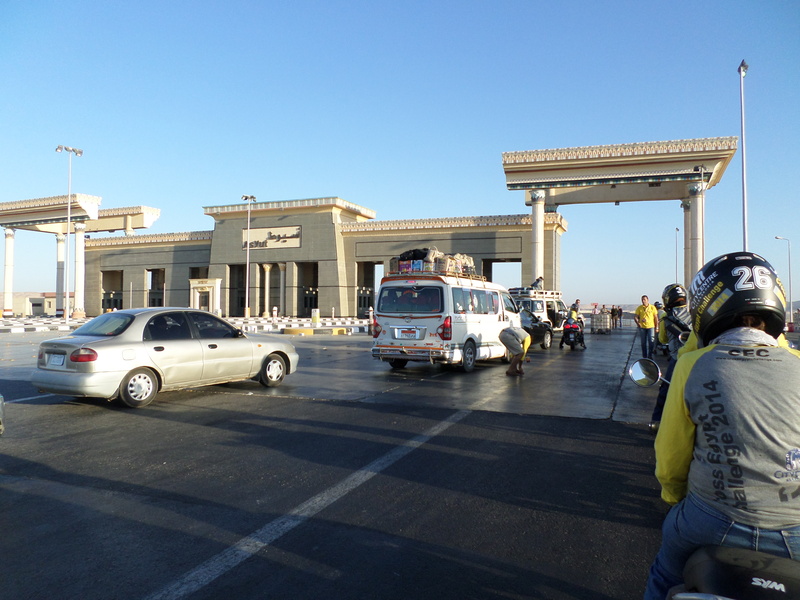 The 2014 season of Cross Egypt Challenge witnessed a more challenging 2,950 km route starting from the shores of the Mediterranean Sea, and passing along the shore of the Red Sea before crossing both the Egyptian Eastern and Western deserts en route to finish the season under the Great Pyramids of Giza. There is more on this event in the story below. 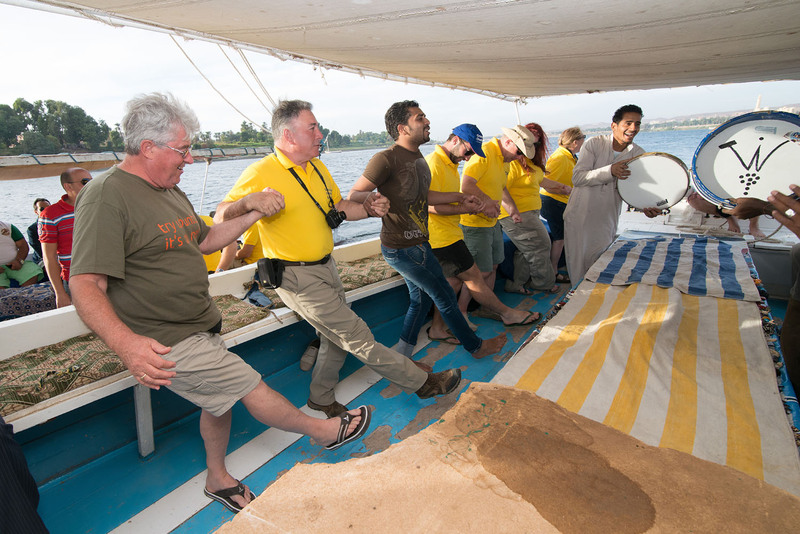 The 2015 season of Cross Egpyt Challenge departed the Mediterranean’s largest coastal city, Alexandria then headed south to Egypt’s capital, Cairo en route to the Red Sea Riviera cities of Ain Sokhna and Hurghada. It then went West to cross the Egyptian Eastern desert to visit the ancient city of Luxor. From Luxor the riders crossed the Egyptian Eastern desert for the second time, to experiece the amazing diving city of Marsa Alam. 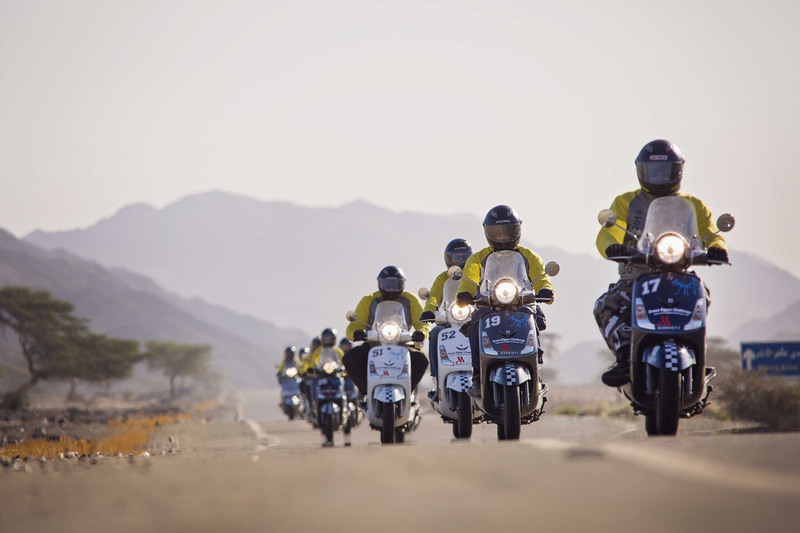 From Marsa Alam, the riders went North to make one last stop at Elgouna before the last stage of the 2015 season of Cross Egypt Challenge which took place between Elgouna and Cairo and ended under the Great Pyramids of Giza. The 2016 season of Cross Egypt Challenge is a total distance of 2,700 km, and will pass through many of Egypt’s finest spots including modern cities, coastal resorts, historical sites, Egyptian Western and Eastern deserts and Egypt’s Nile Valley. The enormous energy and the experience of previous rallies went into organising the CEC events, to make for a pleasant and safe trip as possible for foreigners like us and the many other countries of origin. Sixty people moving daily via checkpoints all requiring security clearances for each, working in logistics of food, luggage, bike maintenance, local authorities when travelling thru very busy towns with excited locals, the tours booked – astounding organisation required to get right. Additionally lots of real time problems thrown their way to resolve. We in turn as riders had to take responsibility to come thru intact. That meant team work, concentration, common sense and awareness of risks based on what we were told and what we see. Importantly that if you don’t follow the “game plan” many things can and will go badly wrong. A day of anticipation I never imagined the circumstances where I could not only see the Pyramids but do a guided tour of every part and on a motorbike to boot! The day starts with a Rotary meeting in Alexandria, as Rotary International are one of the partners of the event. This is followed by an all participant briefing from eleven in the morning to discuss the safety procedures, hand signals, the route, and type of terrain, all this information will be very important during the rally. Later in the afternoon we board a bus to take us to our scooters for the first time. We gather at a nondescript garage to get allocated our bikes and ride 1 km on roads that can only be described as chaotic madness. Cars use one set of rules, taxis another, buses and trucks still different rules and only an Egyptian understands, yet the lunacy works – all you have to do is twist the throttle and pray. But then the big surprise: the launch event; we arrive at the launch to 3000 cheering Egyptians, hundreds of revving, honking motorcycles, rock bands playing and we enjoy our Andy Warhol-esque five minutes of fame. We felt like real rock stars, people jostled to take pictures with us and ask for autographs, with national television coverage, press interviews, greetings from Miss Egypt and a personal meet and greet with the Egyptian Tourism Minister. Suddenly, we are back in the old Cecil Hotel not sure if it all actually happened. With a 5.00 am start, we aimed to always be on time. And we were, at least when we first wake up. We are ready to go at the appointed time, but end up waiting in the lobby and leave 7 am with the sun rising in Alexandria. You learn patience in Egypt! The roads are bad as we take the Desert Road towards Cairo. The nearly two hundred kilometres that separate Alexandria from Cairo dropped two myths: the first is that the desert is quite busy. The second is that in that area has vegetation. Then we hit Cairo’s filthy streets with unbelievable traffic and three bikes almost immediately go down. Those behind wait while those in front keep going (and become lost). Almost instantly, we are surrounded by balaclava-clad forces, attracted by the commotion, who threaten us but no one is hurt or arrested. The lost group eventually catch up. A second delay came on a road that is controlled by the military, which initially did not let us pass the checkpoint. An hour of talks and we move on. We experience our first meal from the Cross Egypt Challenge desert chefs – lunch: Kushari, the Egyptian national dish, served in the middle of nowhere. Magnificent. The day finally ends at Porto Sokhna on the Red Sea which is a dry resort; two kms of fruitless walking produces no beer. Exhausted, hot, tired and sober is more than challenging as first day ends. We had been told that “as a visitor we will have to learn how to accommodate Egypt and not hope that Egypt, with 6,000 years of momentum behind it, will accommodate us”. We found this to be true! Finally the desert! 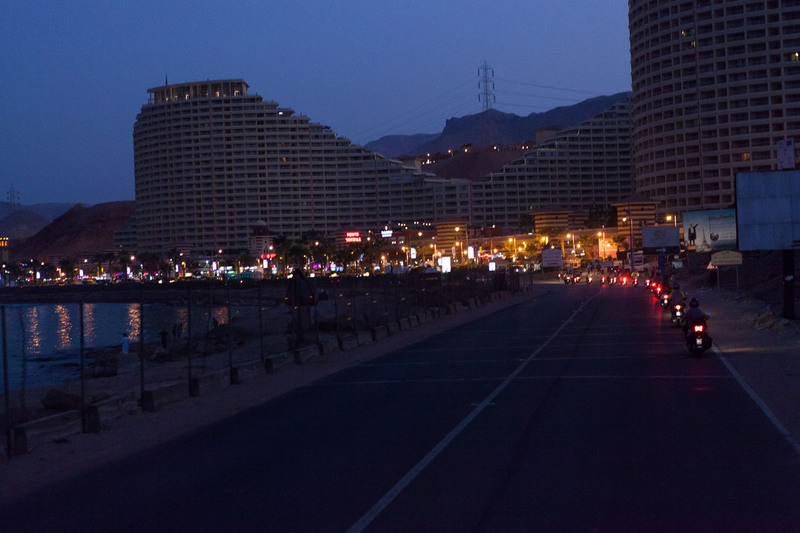 The road South from Ein Sokhna hugs the Red Sea on one side and the sheer, barren mountains of the Sinai Peninsula on the other. We see oil rigs and large ships reflecting off a body of water reminiscent of the Dead sea. 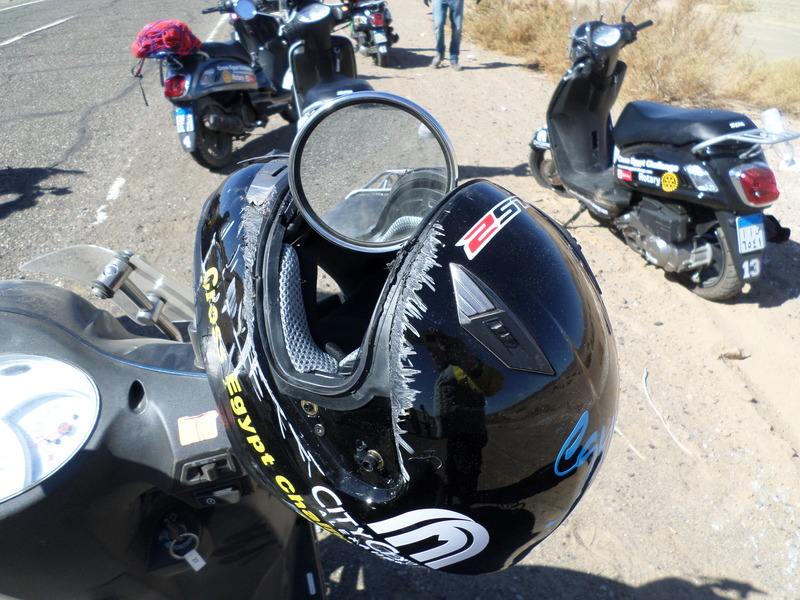 The road is good, the bike is fun, the sun is warm and the desert is spectacular, and then we ride into El Gouna. 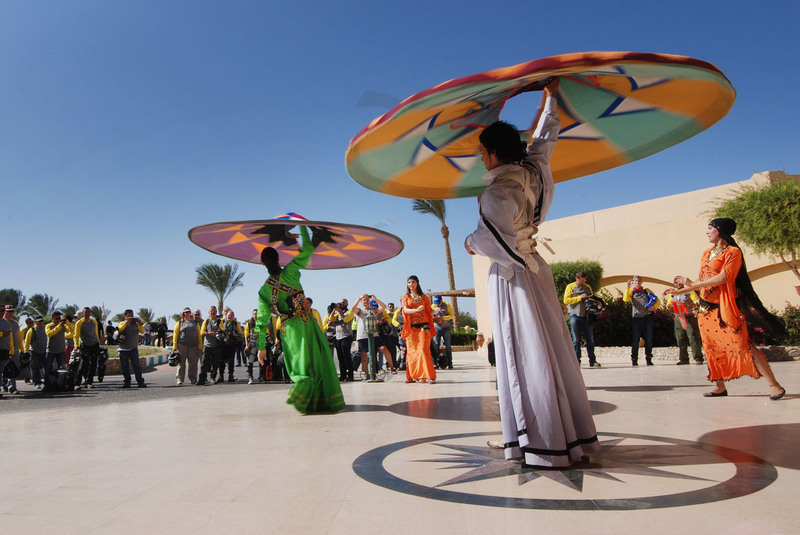 A resort city with awaiting dancers in traditional costumes whirling around in a bright display of colour. Crystal clear water, date palms, ad lib cold beer and abundant wealth. I have died and gone to heaven. We take a Tuk Tuk over to the new Marina and enjoy a few local beers sitting amongst the luxury boat pens before a return Tuk Tuk trip to the resort and bed. Sun, fun and for some a mid afternoon dip in the Red Sea – this stop was welcomed and appreciated by all. The trip from El Gouna to Marsa Alam reveals a glittering sea surrounding the land of an old coral reef, old villages occupied from before the pyramids mix with multimillion dollar villas, a desert without a visible living thing and haggard purple mountains. The road is straight with passable asphalt and the quick passage of miles is broken every 40 minutes by speed humps and guards post, they smile and wave us on. The Mayor of Al Qusair city met us at the city gates to welcome Cross Egypt Challenge riders and express admiration and wishes for good luck. Once again the stage ended early some swam in the Red Sea, others took the opportunity for a beach camel ride. Today the real adventure began and so did the mishaps; a very hard 345 km. For those who think that the Cross Egypt Challenge is spent across a flat country and good roads today this is proven wrong. Leaving Marsa Alam we turn inland into the purple mountains in the pre-dawn light. Lone acacia trees struggle for life, the desert is now mountainous and unrelenting, a wild camel crosses our path. The asphalt is treacherous, rounding a corner a tangle of bikes and bodies greets us. Panic sets in – where are my wife and friends? All in our uniform of grey T-shirts with Yellow sleeves I need to scan numbers on helmets. Relief floods over me as all I am looking for are astride their bikes, then I feel shabby and then the guilt washes. What of the others? It is only then I see a raven haired beauty from Peru groaning, broken, clothes torn and her modesty exposed, someone covers her eyes from the sun I hear other riders in distress but am unable to tear my eyes from this scene. Another rider lies like a crumpled doll in the middle of the road and has not fared as well, and it is obvious she has multiple injuries that will require more than surface dressings. Medical attention arrives quickly and there is relief when it is reported she can move all limbs, some morphine relief and they scrape her from the asphalt. Then the music starts and the start your engines signal is given, we ride on as if nothing has happened on to a verdant Nile valley. A few kilometres on, suddenly, it seems that we enter another country, such was the amount of green fields. We zig zag through Edfu – almost a metropolis – and Africa feels her in the eyes and nostrils. Third world children cheering and reaching out to touch us as we pass. Shortly after, already out of town again in the desert, then finally arrive at the Aswan Helnan hotel and a room overlooking the Nile. I feel sick inside wondering what happened to my co-riders and what is to come. Monday, bloody Monday ends. We have good news overnight — our hurt riders from yesterday will recover. The road to Abo Simbel crosses the Nile and enters the Western Desert, a line of straight black cutting the yellow sands of the desert and merging with a translucent blue sky, even in November the heat is oppressive. A desiccated dead camel and many animal tracks shows there is life here. We arrive at the Aswan dam, a huge body of water 4 times larger than Lake Argyll, a huge lake in Western Australia. We are three km from the Sudan, the border is on the other side of the lake. Abo Simbel and the Nile, a world renown temple and the largest river in the world, they are breathtaking. We all let the incredible beauty wash us of any trepidation or fear for the rest of the adventure. We sit around the swimming pool sipping cold beer, after nightfall we visit the temples for the sound and light show. Cannot help thinking that the main voice is the Old Spice commercial guy. It is night and the sky is lit by millions of stars. Day six repeated the 300 kms back to Aswan. The bikes are getting very tired as we fast approach the symbolic half way mark. Three had to be carted off the road, one with a popped spark plug, another a seized motor and the third a minor electrical issue. 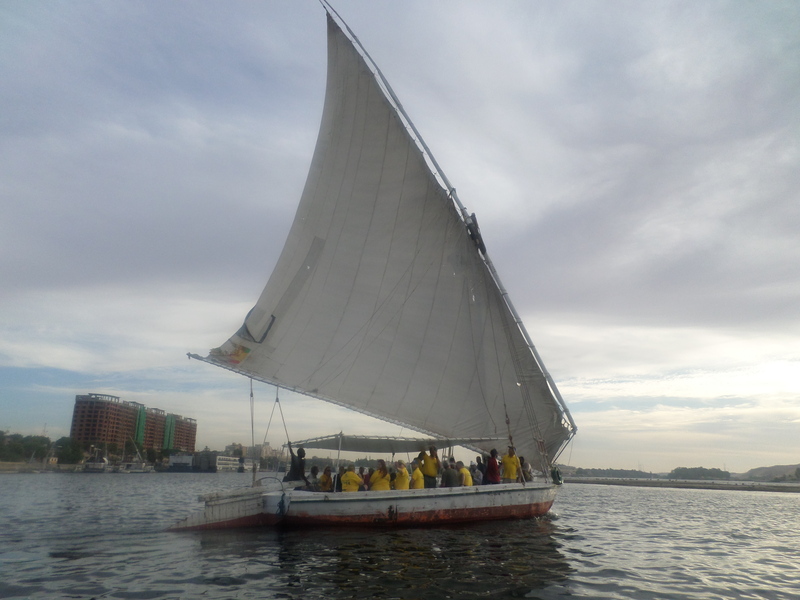 The day ends with a sunset cruise on the Nile in a felucca and shopping in the flea market. Three kilometres of stalls and folks overjoyed to see some tourists again. One of the travelling Australians dropped his wallet and someone ran after him to give it back. The Nubian are lovely happy people who enjoy life. Tomorrow we see Luxor, the centre of the ancient world. 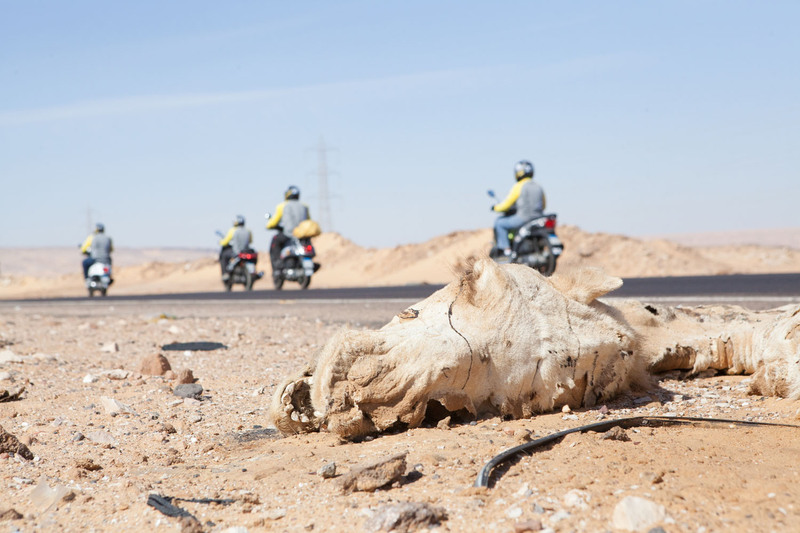 We ride thru the western desert, the asphalt is in blocks like cobblestones, it has been laid directly on the sand cracking and is moving, combined with overloaded trucks and roadside fires made of leftover tyres. So the life of the road is short and it’s passage a challenge. A truck passes loaded with camels sitting quietly no sides or roof. Children line the streets some on the way home from school, some in their mothers arms all waving and smiling to see so many motorbikes in a line. We arrive in Luxor to magnificent statues and temples documenting the very beginnings of our civilisation. 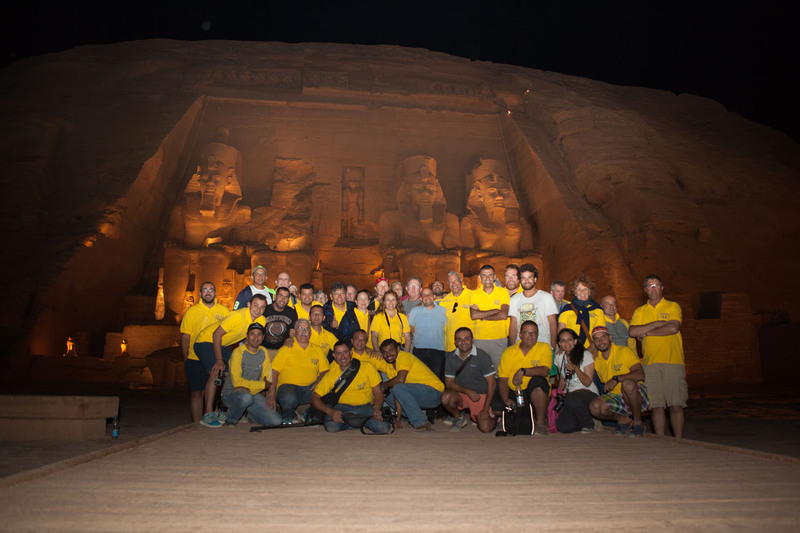 The stage ended in Luxor with a group photograph with the Hatshepsut’s Temple as a backdrop. As night falls we board buses to tours of Luxor and Karnak Temples. We left the hotel with the fog and cold of Luxor to Asyut. The route sees us leaving the desert floor rising to a Mesa with frequent cuttings and gullies, even some surface water and a landscape resembling a “gibber plain” back home in Australia, which makes this the most interesting riding for days. A light wind catches us as we climb through the mountainous passes while red stone turns to pure white and back again to red again. Today is about natural beauty not the man made monuments. The road is excellent. Our arrival has been anticipated by the city and a reception is waiting for us and later whirling dancers leave us spellbound. The Cross Egypt banner has been set up for final official photographs. The rally ends tomorrow and the realisation that our adventure will soon be over sets in with another dry night, with not even a shandy in sight. Another day on the road starts before dawn in cold conditions. Six lanes of perfect asphalt and more spectacular desert, I am over scenery, what I need is a beer. Thirty kilometres out from Cairo we see the Pyramids, our finishing point, but it takes another hour there such is their scale. No human should die without seeing them. The sun sets, the ride finishes the band plays on! 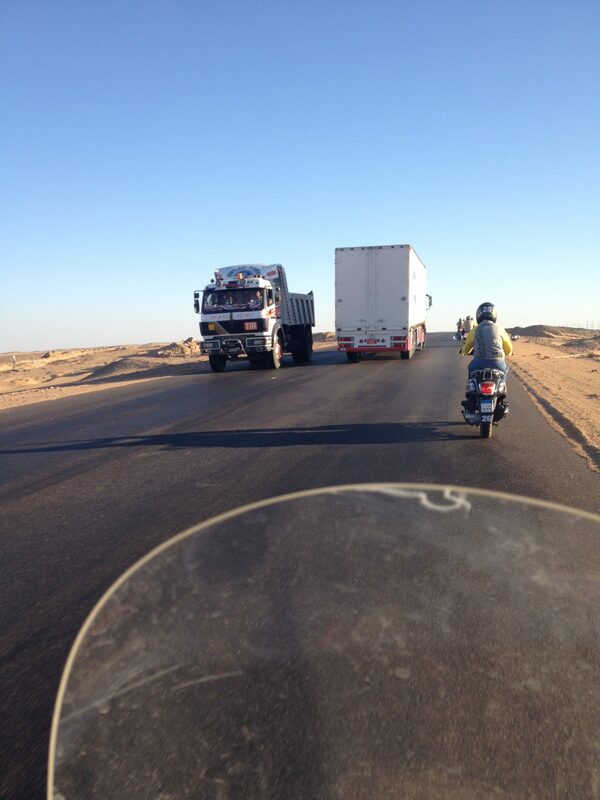 Egypt has been a very safe place to travel, the hazards have been the motorbike and the roads – as it is every time you swing your leg over the engine! If you are even remotely inclined, don’t be afraid to take this journey in Egypt; every grain of sand has a story, Moses lived here, Jesus lived here and Mohammed also. Napoleon and Alexander the Great invaded. Now I have travelled its road and placed my fingers in the hieroglyphics that Ramses the second had carved for him 3500 years ago. No security issues came our way. The risks we could manage was the way we rode our bikes in an environment the locals see as normal and we see as confronting. The Cairo traffic had an ability to eat you up. Freeway off ramps peeling off left and right with no apparent signs or logic. 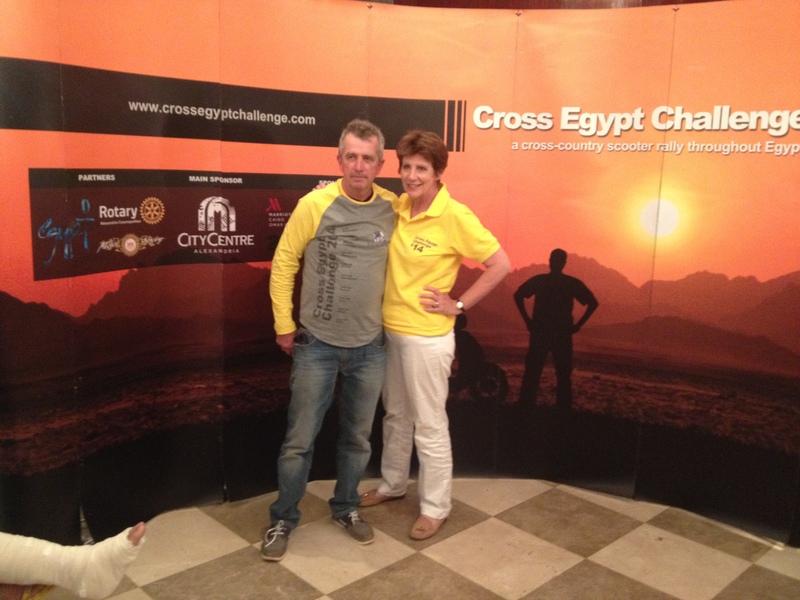 The Cross Egypt Challenge remain one of the most professional groups we have had the pleasure to deal with. 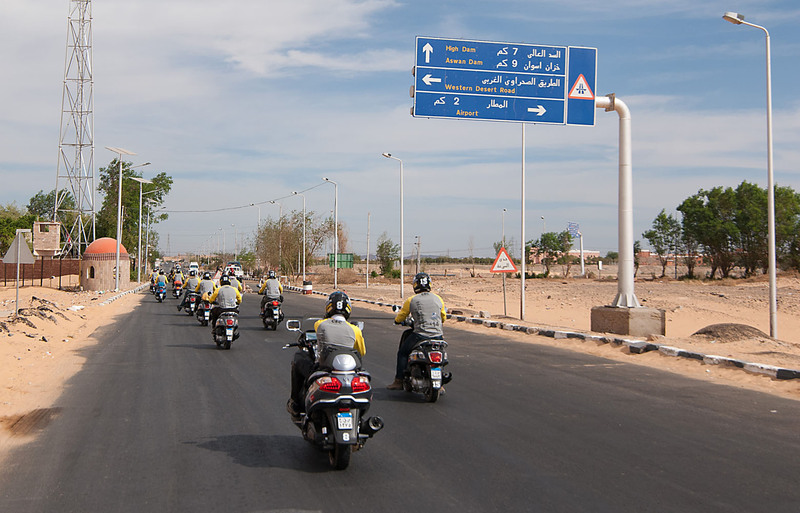 Egypt is safe but motorbikes are not, everyone should see Egypt and this is a great way to do it. The acid test is the answer to the question. “Knowing what we know now, would you do the CEC 2014?” The answer for me is as l think for all Australians is a loud yes! How could you not take such an opportunity and go and see Egypt? It was hard. It was fun. It was a challenge. 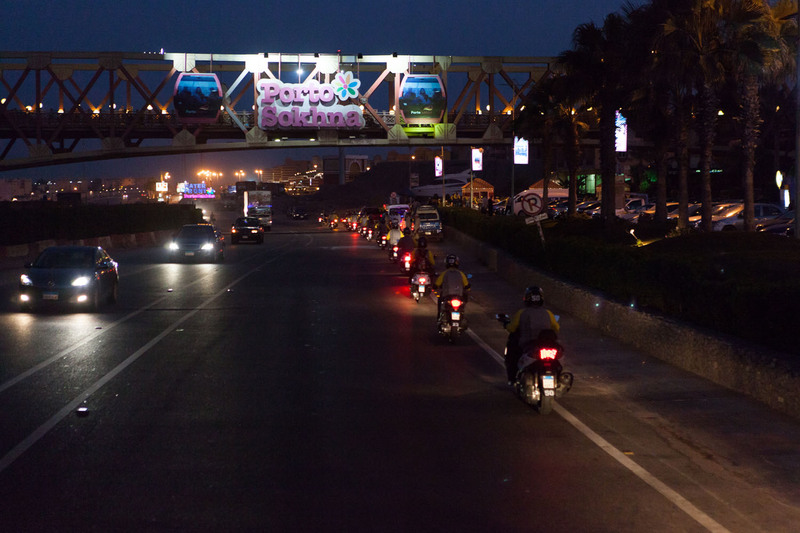 Previous articleWhat is your route to Amerivespa – tourist or turnpike ?